Can I just tell you my new flavor obsession? All-natural harissa spice blend! It can take the simplest of dinners to a whole new level of tasty. This easy, flavor-packed grilled harissa chicken dinner is a family favorite. 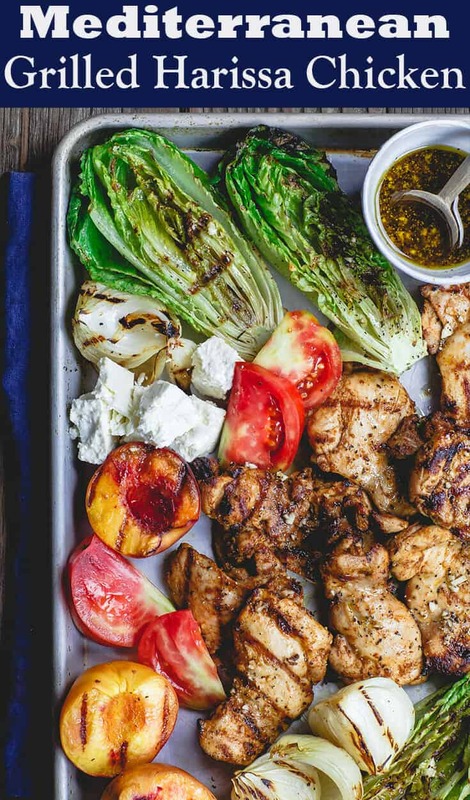 And if you’re entertaining, this harissa chicken is great served on a large sheet pan along with all sorts of grilled veggies, and a little secret sauce to add on top! If you’re not familiar, harissa, pronounced ha-Ree-sah, originated in North Africa. Most people think of it as a hot chili paste, but what I use here is a unique all-natural spice blend of three types of chili along with sumac, caraway, fennel, cumin, coriander, garlic and a hint of ground peppermint! I’ve been playing with harissa a lot lately, adding it to several dishes including these crispy baked zucchini chips, quick lamb chops, and of course, today’s harissa chicken. Why this Grilled Harissa Chicken Works? The idea behind this harissa chicken recipe is not to create a blindingly spicy chicken, but an exciting chicken dinner glowing with flavor and depth. 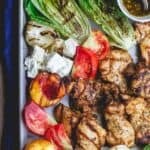 This time, I turned my harissa chicken into an eclectic, and super do-able grilled dinner board. I added grilled lettuce, sweet onions, peaches, and a few other favorites. If you don’t feel like grilling all the things, simply serve this harissa chicken with a Mediterranean salad like this couscous salad (works as your grain as well) or Greek salad. Also, sides like these Greek potatoes or roasted veggies will work well here. A must-try Harissa Chicken Recipe! 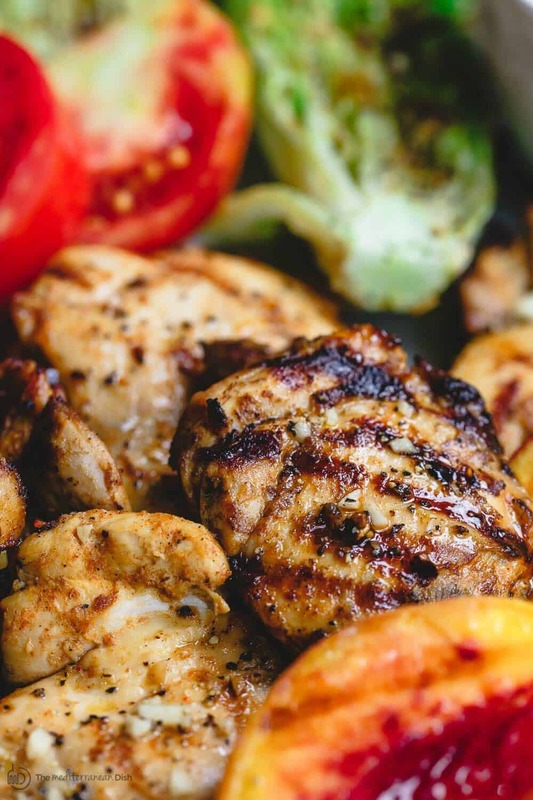 Simple spice rub + a Mediterranean citrus marinade take chicken dinner to a new level! 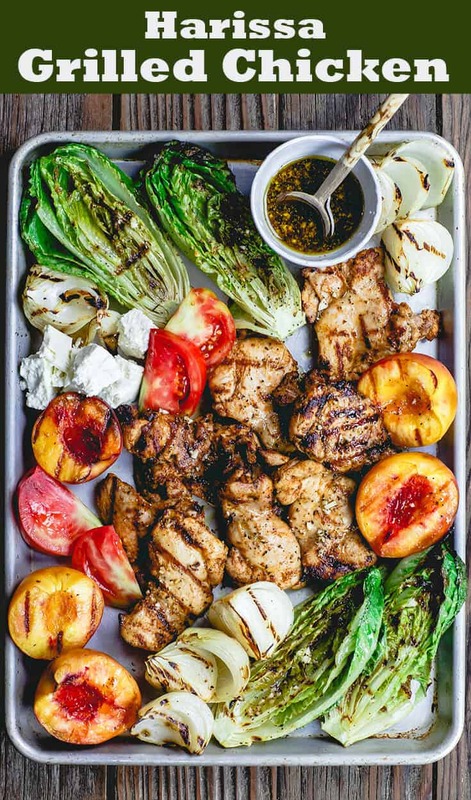 Add grilled lettuce, onions, and peaches or see notes for salads and sides to serve instead. In a small bowl, mix the spices to make the spice rub. While grill is heating, prepare sides for grilling (optional). Brush lettuce with extra virgin olive oil and season with salt and pepper. Do the same for the sweet onions. Brush halved peaches with extra virgin olive oil, but do not season. Place the chicken thighs on the grill. Cover for 5-6 minutes, then turn the chicken over and grill for another 5-6 minutes covered. If adding grilled sides. Grill lettuce and onions over direct heat, turning over every 1 to 2 minutes until lightly charred. Grill peaches over moderate heat (move away from direct heat) for 5 minutes on each side. While chicken and sides are grilling, prepare dressing. Simply add dressing ingredients to mason jar. Cover tightly and shake to combine. 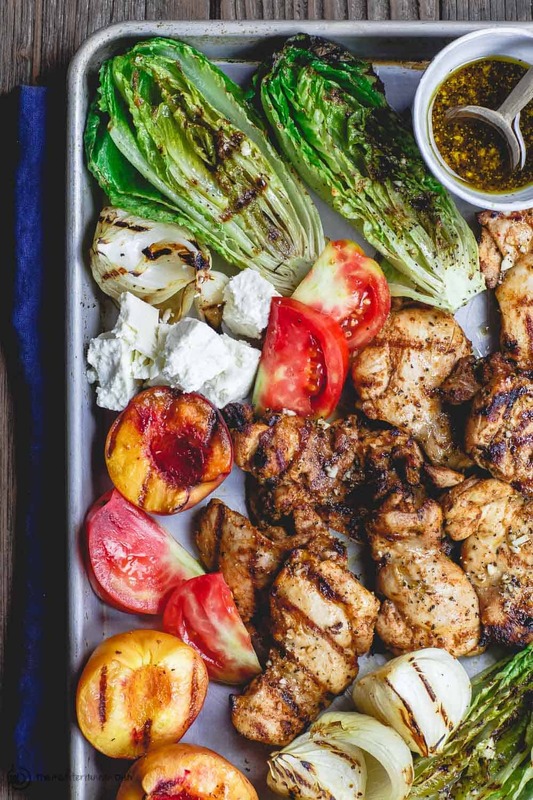 Arrange chicken, grilled veggies, feta, and sliced tomatoes on a large tray or board. Drizzle with a bit of the prepared dressing (serve remaining dressing on side for people to add as they need). Serve with your favorite grain such as rice or quinoa, or serve with warm pita bread. Enjoy! Note 1: Budget 2 hours or more of inactive marinating time for best results. Note 2: If you don’t feel like grilling all the things, simply serve this harissa chicken with a Mediterranean salad like this couscous salad (works as your grain as well) or Greek salad. Also, sides like these Greek potatoes or roasted veggies will work well here. Recommended for this recipe from our all-natural and organic spice collections: harissa spice blend, sweet paprika, cumin, and coriander! SAVE! Create your own 6-pack from our spice collections! Recommended for this recipe: Private Reserve Greek extra virgin olive oil (from organically grown and processed Koroneiki olives). SAVE! Try our Greek EVOO Bundle! I made this last night and it was FABULOUS! I did use boneless chicken breasts, flattened to a consistent thickness. I used the Harissa spice mix from you. It was my first experience of the blend. Delicious. The drizzle of dressing on those syrupy grill peaches was just the bomb. I posted a picture in a couple of Facebook foodie groups I am in and got much great feedback. Hubs said to keep the recipe close by so we can make it again. Thanks so much for helping us eat more healthfully. Awesome, Judith! I am so glad you enjoyed the recipe. And love hearing that you’re enjoying the Harissa blend as well. It’s one of our new blends, and your feedback is so appreciated! Five stars from both hubby and me. Awesome combination of flsvors. We will definitely have this again. This is the first time I used the Harissa spice mix I bought from you. It is delicious. I just ordered a 6-pack of spices & can’t wait to try this & a few other recipes ( Za’tar & Aleppo Pepper recipes would be appreciated 😉 )……..so Thank you Suzy, I’ll be trying this this weekend !!! Awesome, Terry! I can’t wait to hear once you’ve tried the spices! And yes, the recipes will keep comin! 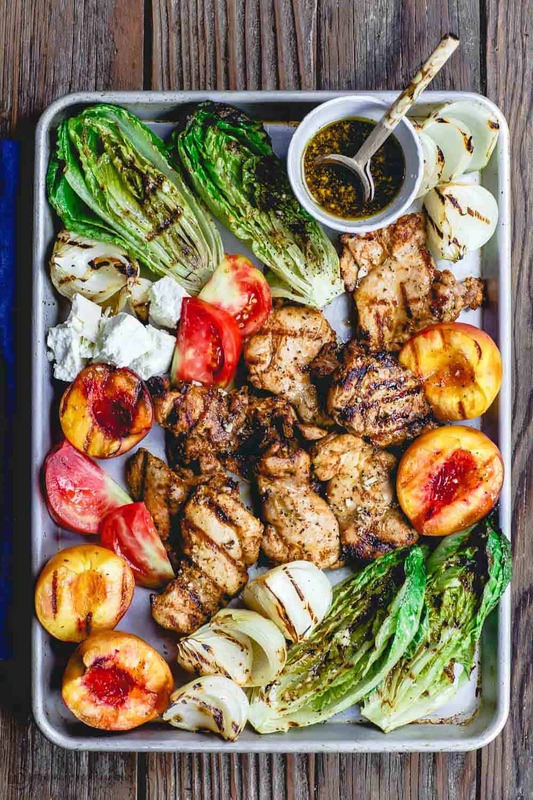 This is the perfect summer dinner – so many great flavors and the grilled veggies are perfect! Amazing flavors. Those pops of color together are a feast for the eyes! Love the depth of flavor in this chicken dinner! Totally a must-make!